In our daily lives we, or at least I, tend to get caught up in the day-to-day stuff that means very little and lose sight of what’s really important in life, like spending hours upon hours cooking a single meal that our children will inevitably eat only a single bite of forcing us parents to ultimately eat more thereby reducing our lifespan significantly while also having to store the leftovers in the back of the fridge where they will remain until our kids are old enough to need a last second science experiment to take to school. This is truly something to be thankful for. Besides lowering our chances of survival via obesity and bacteria previously unknown to man, Thanksgiving gives us an opportunity to reflect on what we are thankful for in life; like giant balloons and/or Al Roker. This morning, as I cooked eggs and hash browns for my sons, I turned on the TV and told my two boys that they should watch the exciting display of balloonery and parading that is the Macy’s Thanksgiving Day Parade; and watch they did. For two minutes before they then decided that cleaning their rooms would be more fun. As impressive as the size of the balloons and lip-synching skills of the performers are, the fact of the matter is that parades are boring. There I said it. I’ve tried for years to watch this parade and get the enjoyment out of it that so many others seem to derive from watching this display of craftsmanship, hot air and Al Roker but I just don’t get it. Perhaps I’ve lost the wonderment of seeing an enormous floating Kim Kardashian balloon. Perhaps the knowledge that in a few short hours I will have eaten enough to become an honorary Kardashian (though certain parts of my anatomy will never live up to the Kardashian standard and will ultimately lead to my shunning from this glamorous clan). Perhaps, also like the Kardashians, I am dead inside. Whatever the case, I just don’t enjoy watching parades and while there is some shame in this, I’m also thankful that I am not a Kardashian. 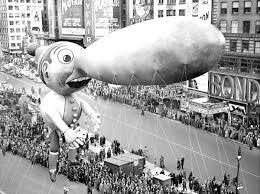 While I am thankful that I am not a Kardashian or an enormous balloon full of hot air in a parade (not much of a difference between the two, I know) each Thanksgiving I am reminded of something that I am not thankful for: parades. I really dislike…Wait. I’ve already said this haven’t I? Okay, what about Al Roker? Have I talked about him? A little bit huh? Kardashian jokes? Well then. Speaking of sweatpants, a little known fact about the first Thanksgiving is that, in addition to the bountiful feast that the native Americans and Pilgrims enjoyed together, one particular native American, Squanto (roughly translated as “he whose pants expand around the waist”) gave each Pilgrim a pair of designer sweatpants from The Kardashian Collection at Sears. It has been debated that these sweatpants, were really what allowed the Pilgrims to survive that first feast. Later, in 1863, President Abraham Lincoln declared that all sweatpants would be put on sale by all businesses on the last Friday of November leading to the creation of Black Friday and also resulted in retail corporations spending thousands of dollars (some larger amount in today’s dollars) to pay lobbyists to push the government to declare the last Thursday of each November to be a holiday called Thanksgiving wherein people would eat much more than any one human should thereby creating a bigger demand for sweatpants and offsetting the mandated sweatpants discount put on retailers the following day. 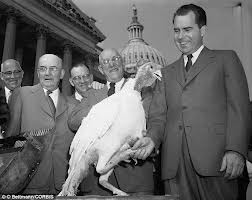 Additionally, the Thanksgiving tradition of the Presidential pardoning of a turkey was started when President Gerald Ford pardoned former President Richard Nixon for the crime of enjoying the Macy’s Thanksgiving Day parade. Ford was wearing sweatpants when he signed the pardon. Although Richard Nixon was pardoned for his crime of enjoying parades, what is unpardonable is the way the Chicago Bears are now playing. After having a 14-3 lead against the Detroit Lions, the Bears now trail 24-14 at halftime. The Bears’ performance is so bad that I’m currently contemplating changing the channel back to the Macy’s Thanksgiving Day parade as the performers in the parade are more skilled at pretending to sing than the Bears’ players are at pretending to play football. While the Bears’ are doing their best to prevent me from eating too much by putting on yet another sickening performance, I’m determined to stay positive and focus on the fact that there are bigger and more important things than a certain part of Kim Kardashian’s anatomy. Okay, maybe not bigger but certainly more important. In the end, so to speak, family, friends, food and health should be in the forefront of our minds today rather than parades, Chicago Bears and Richard Nixon, for it is these things that make Thanksgiving truly special. These things and sweatpants, that is.